Oh let me assure you Mr. Bond, I intend to control the world’s supply of rosemary.. I would post a photo of the rosemary plant in my herb bed but I don’t think the internet is big enough to host it. So it was definitely herb harvesting time this week. As well as rosemary, I picked oregano and French tarragon, both of which have grown really well. When looking to store herbs, there’s always the matter of whether to dry or freeze them. 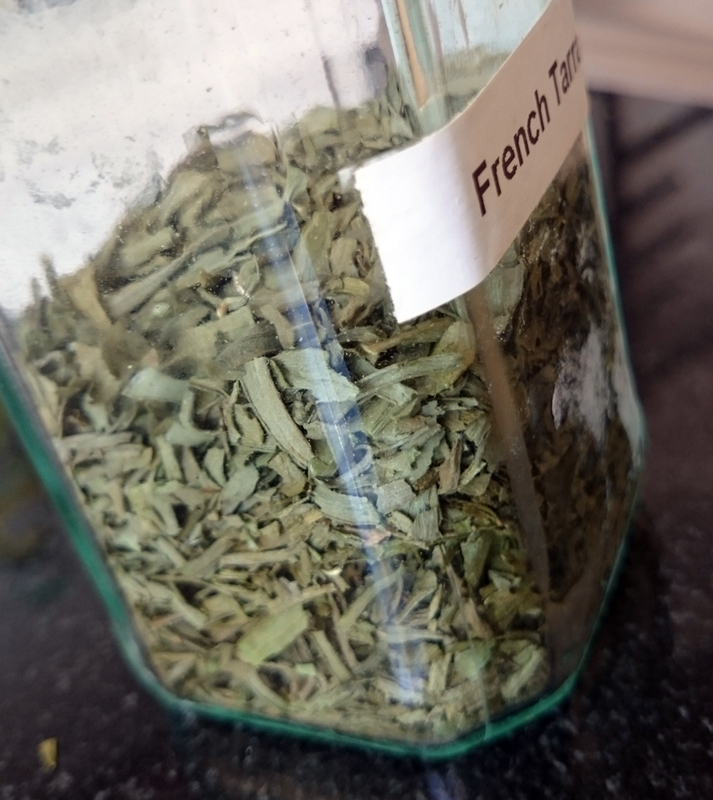 Personally I find shaking dried herbs out of a jar the most convenient thing when cooking. 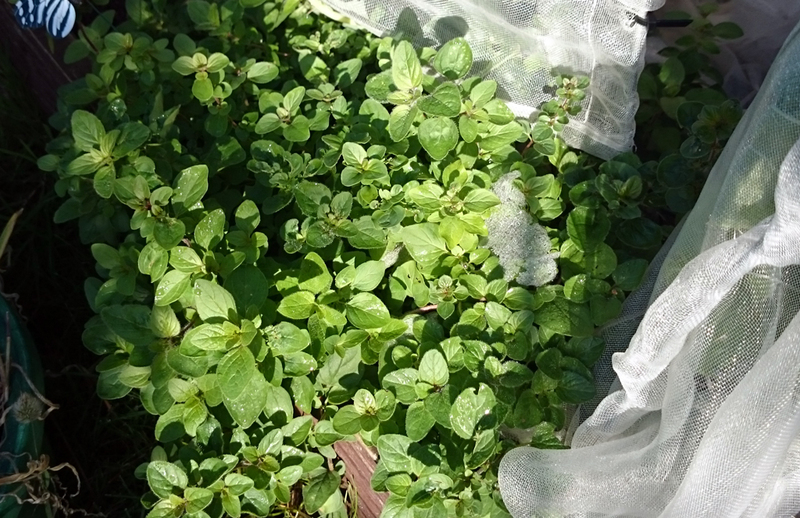 Picking a few herbs out of a bag in the freezer or dropping an ice cube packed with frozen herbs into a dish are both OK of course but not quite as instant. But it’s important to be driven by the characteristics of each herb. Some lose most of their taste and aroma when we dry out their oils, so freezing is best. Others don’t, so are well suited to drying. Moreover there are some herbs which reputedly improve when dried. 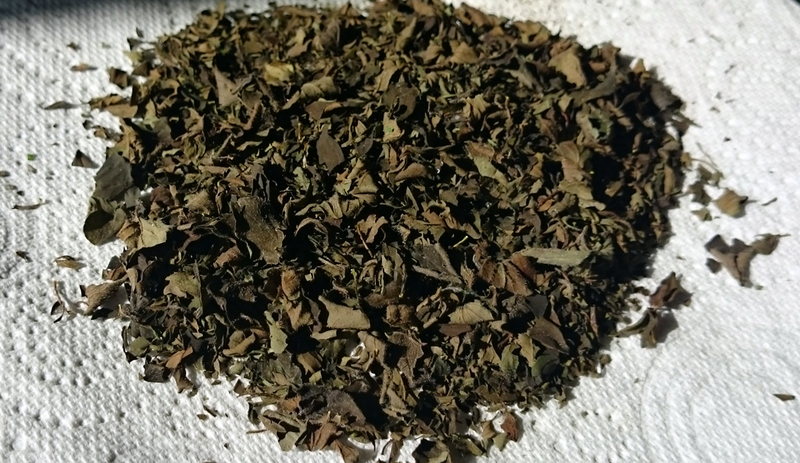 Oregano is a case in point, so I enjoyed oven drying a large bunch of mine a few days ago. 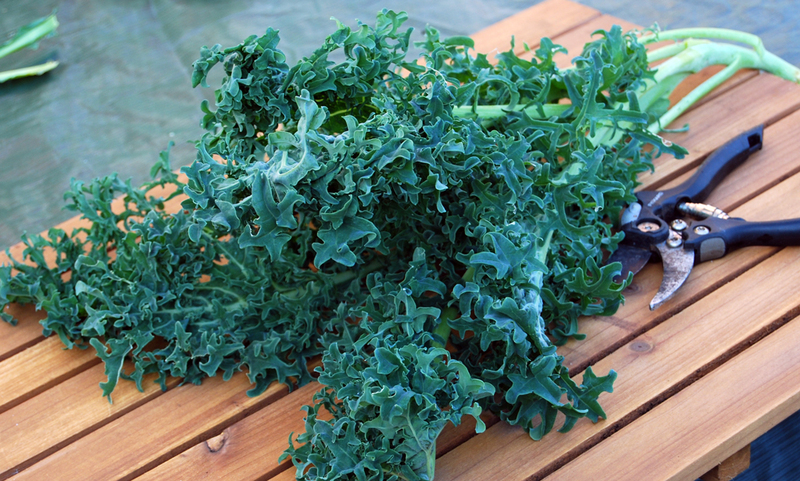 The pizza plate with holes in its base is perfect for letting the warm air circulate among the chopped leaves. Quite fitting really, as tomato-topped pizza is a perfect dish for adding oregano to. 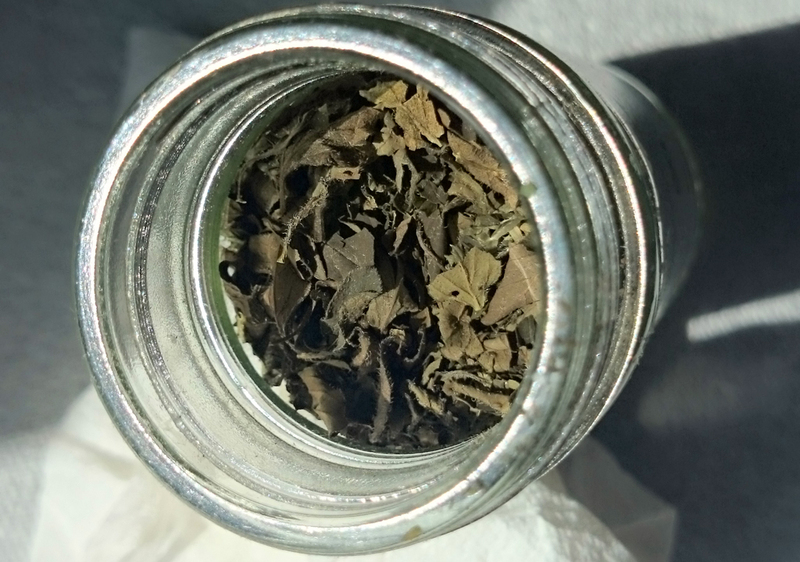 Once the leaves are cooled and crisped up, it’s always wise while scrunching them to pick out and discard any which are still flexible as they’re likely to still contain some moisture, which could cause the whole lot to rot in their jar. 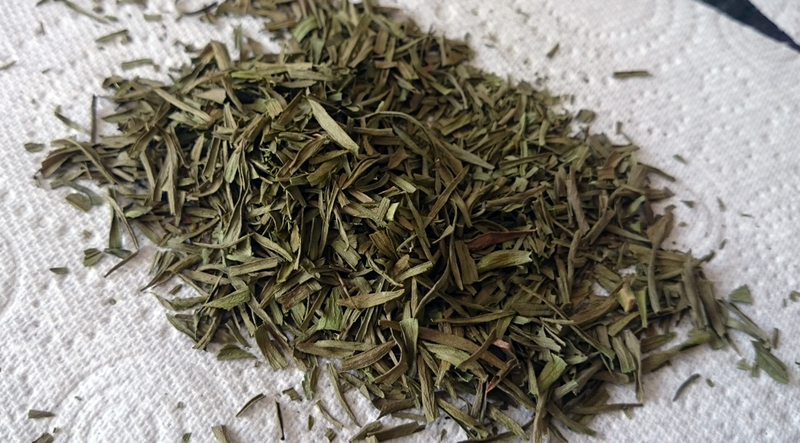 Tarragon was next, and that’s a herb which does lose some flavour when dried. 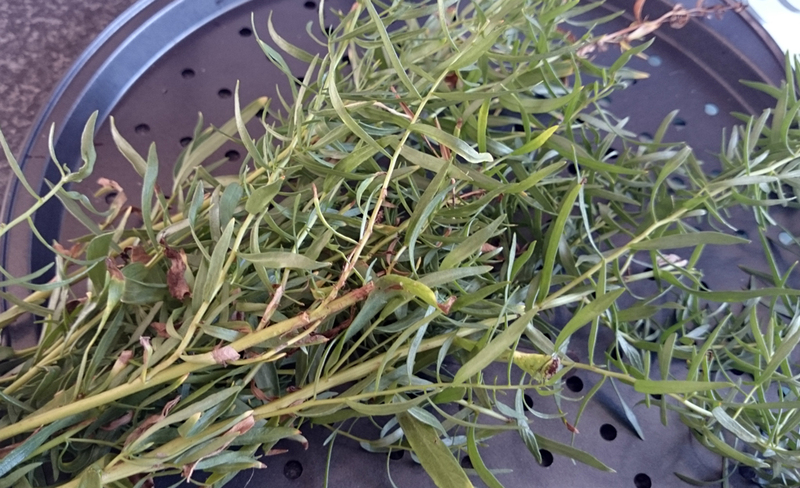 However, I’ve been growing French tarragon, which is stronger and tastier than the more usual Russian tarragon. So with that extra oomph, enough of the aniseed/minty aroma survives the process to make it suitable for drying. When it comes to my other favourite herb – basil – I’ll freeze any excess because it doesn’t keep its flavour too well after drying. Tricky all this, isn’t it. Especially when you then consider that some herbs and spices lose most of their flavour when cooked; basil and mustard being prime examples. 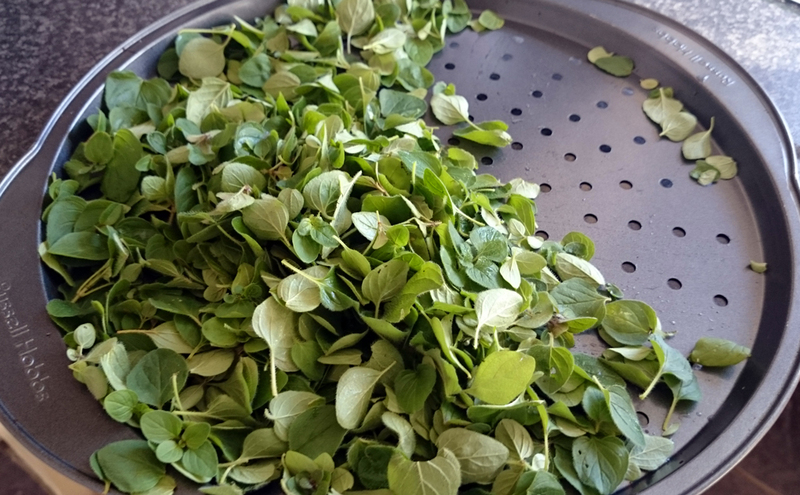 In such cases it’s wisest to add them to a dish right near the end of cooking, if not just before eating, as in tearing basil leaves and dropping them onto Italian dishes just as you serve them. 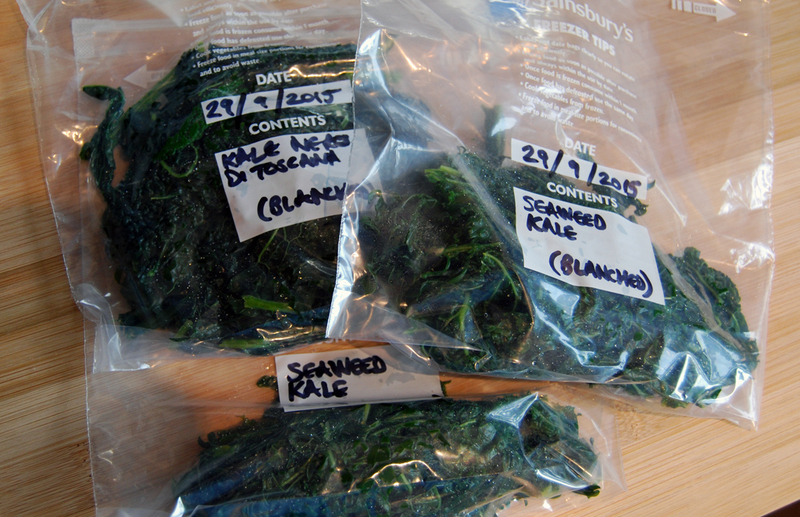 What did make it to the freezer today was some small leafy brassica crops: a good bunch of seaweed kale and another of Nero di Toscana kale. 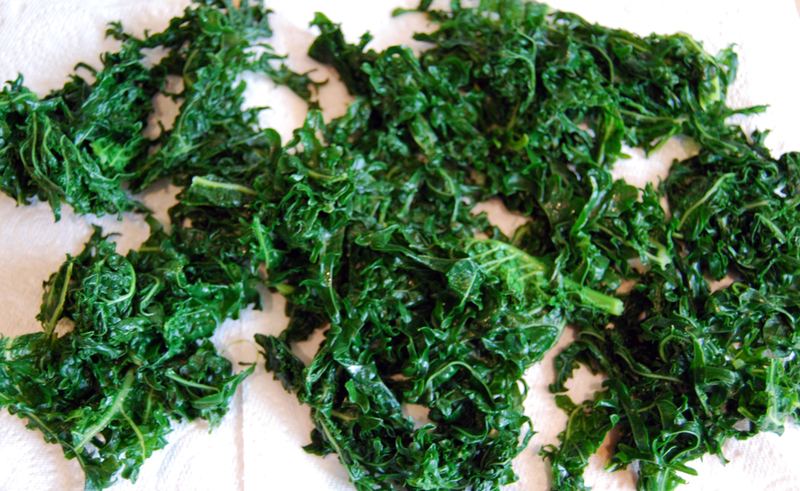 The seaweed kale is nothing to do with seaweed apart from looking a bit like it, but a few seconds of hot deep frying turn it into a wonderful light and crispy side dish, especially when seasoned well with salt, soy sauce or even balsamic. The Nero di Toscana is less frilly and more traditionally curly. 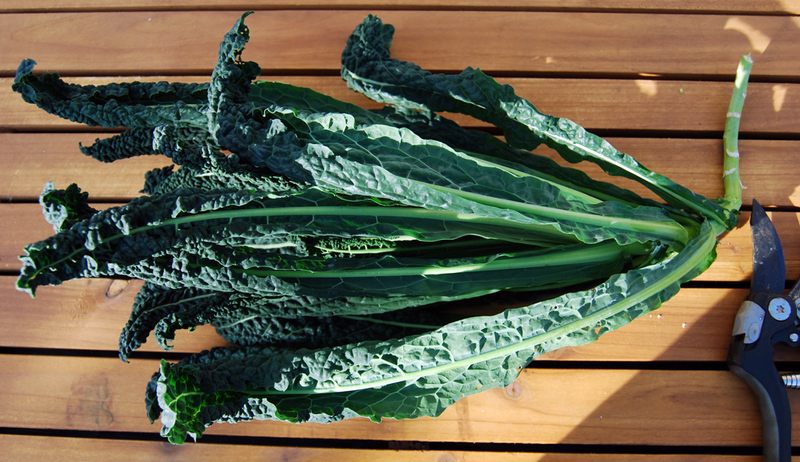 A very dark green (hence the name ‘Tuscan Black’), it’s packed with both taste and goodness and cooks quickly. So much so that the blanching before freezing needs to be quite brief so as not to overcook it and lose too much of the healthy nutrients. 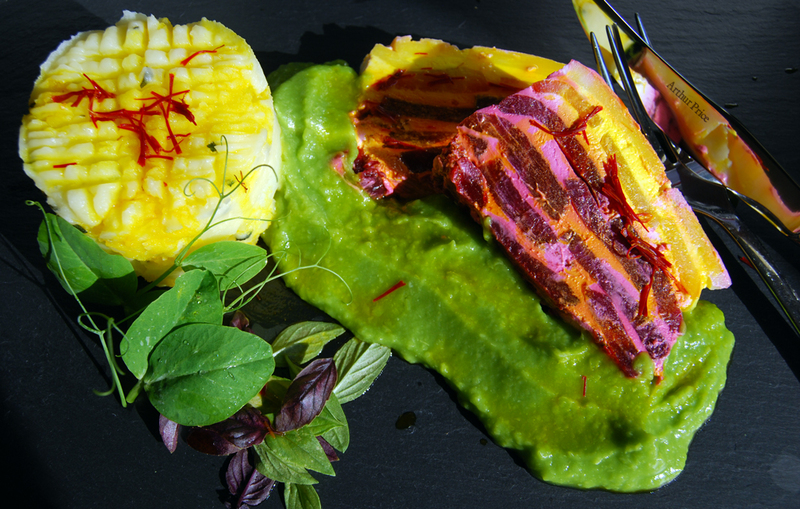 Meanwhile I prepared a slightly unusual dish as an entry to an on-line grow you own food competition. The beetroot terrine, made of white, yellow and purple beets which I lifted yesterday, needed to chill, weighed down, in the fridge overnight so that the beets and goats cheese would set firm together. That worked reasonably so today it was just a case of mashing some of last month’s Maris Piper potatoes and puréeing some Douce Provence peas. Some strands of last year’s saffron added colour on top of the potatoes. I’ve entered quite a few categories of the competition, which is enjoyable as it helps one to improve technique and learn about presentation. 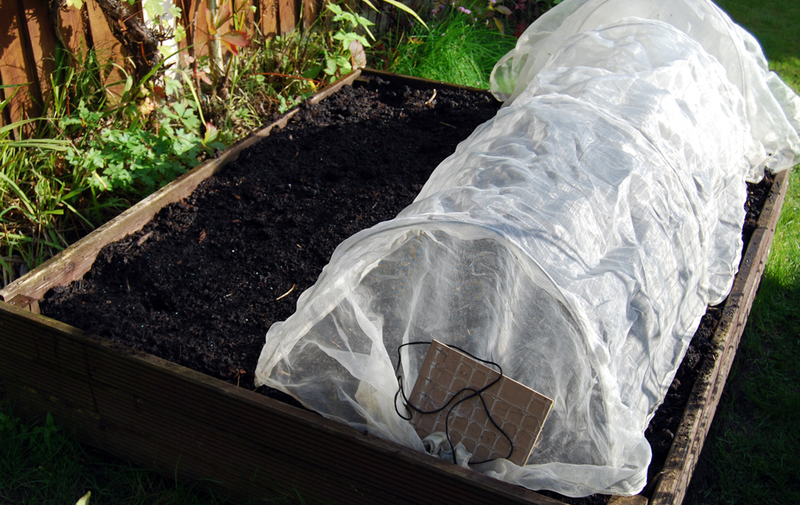 Back outside, I prepared one of the beds for the winter. This square box had potatoes growing in it until recently, but is changing purpose for next season. Half of it will be hosting onions and garlic and the other half is yet to be decided so I’ve sowed a hardy green manure mix, which both fixes nitrogen and adds organic matter. Come the spring I’ll dig that back into the soil and plant whichever crop will do well alongside the onions. Cue the companion planting list. 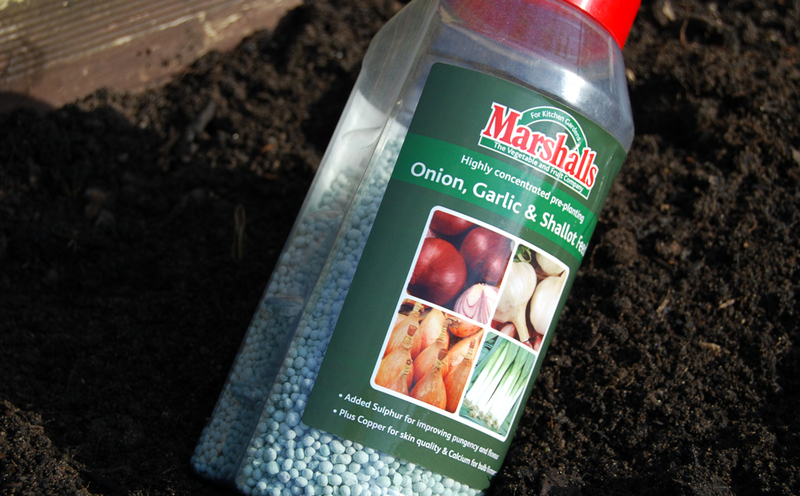 I’ve added some allium pre-fertiliser to the bed and will let the granules dissolve for a week before planting the sets. The onions will be red Electra and white Senshyu, both overwintering varieties, the latter from Japan. 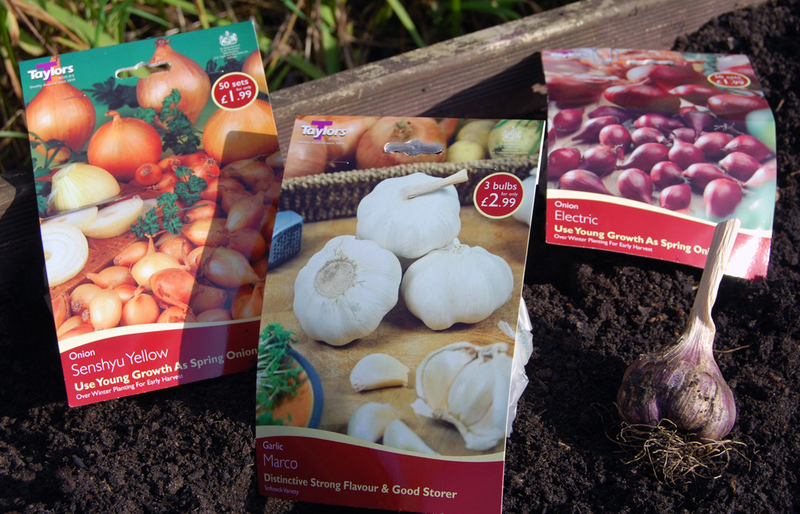 For garlic, I’ll sow some of this year’s Germidour cloves and the pack of Marco which I bought last week, apparently a variety known for its strong flavour.